Homemade Creamed Corn is a southern staple and is much easier to make than you might think! This recipe is made in one pan, in about 20 minutes and you can choose to use fresh for frozen corn. It’s creamy, slightly sweet and everything you want creamed corn to be! This homemade creamed corn recipe works, mainly because of the addition of cornmeal. The cornmeal has two purposes: first, it thickens the creamed corn mixture to a perfect consistency, and second, it contributes to the corn flavor, adding depth and a bit of nuttiness. Turmeric is used as a little boost of flavor and to enhance the beautiful yellow color. Some recipes use milk, but I prefer to use cream for its richness and velvety texture that adds to the dish. If the only creamed corn you’ve tried has been out of a can, then boy-howdy do you need to try this recipe! I’m a sucker for all things corn: this cornbread, these corndogs, corn casserole, and now this creamed corn. Maybe it’s because I’m American? I don’t know. But I do know that this homemade creamed corn would be mighty good as a side dish to your Easter ham this year! 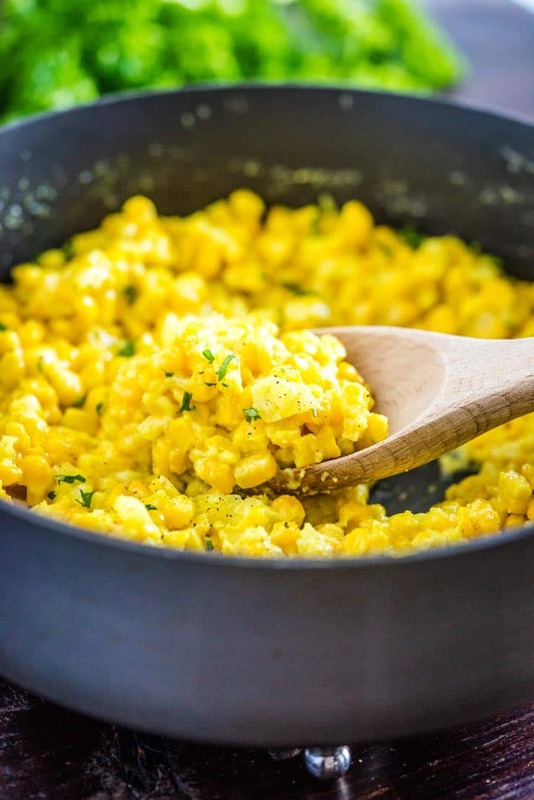 Choose your Corn- Fresh or frozen corn works excellent in this recipe. 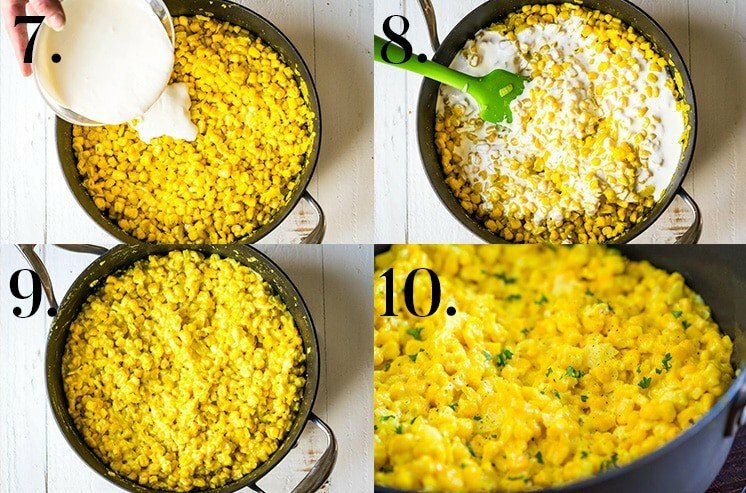 Fresh corn will yield a slightly softer recipe as you can really scrape the pulp off the cob and use it in the creamed corn if desired. If using fresh, watch this video to learn how to cut corn off the cob without making a mess. Saute The Onions- This recipe cooks pretty quickly, so it’s good to cook the onions until they are soft before adding the rest of the ingredients. The onions get cooked in some butter with a bit of rosemary and salt. The salt will help the onions release their water and cook quicker. Add-In Dry Ingredients- Corn, turmeric and sugar get added to the pan and cook for a few minutes. Cornmeal gets sprinkled over the top and is stirred in to combine. Add-In Wet Ingredients- Heavy whipping cream is my liquid of choice. 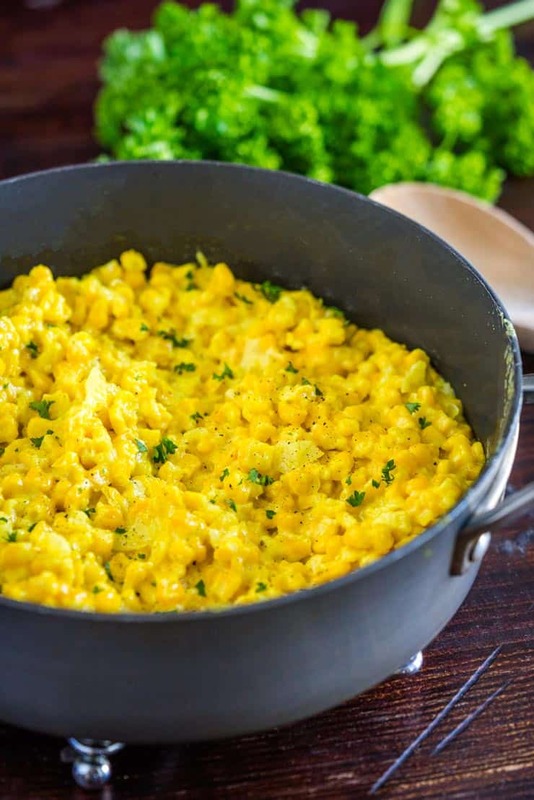 It adds a richness to the creamed corn and makes the cornmeal velvety and smooth. Stir it into the corn, reduce heat to medium, keep stirring and cook until thickened. Continue to cook until the corn is very soft. Season with pepper and you’re ready to serve! Choose fresh or frozen corn kernels. Fresh will make a softer recipe as the kernels will likely be smaller. Really scrape the cob with the back of the knife to release all the bits of corn pulp and add them to the pan. Frozen corn works just as well though. (That’s what I used in these pictures). Let the onions cook until very soft, or you’ll have crispy pieces of onion in your creamy corn. When adding the cream, stir the mixture continuously until it thickens or you’ll have lumpy homemade creamed corn. Explore- I linked to a few of my favorite corn recipes above, but here’s another– Tortellini Primavera. I use all sorts of fresh veggies, including fresh corn in this summery tortellini recipe. It’s delicious! 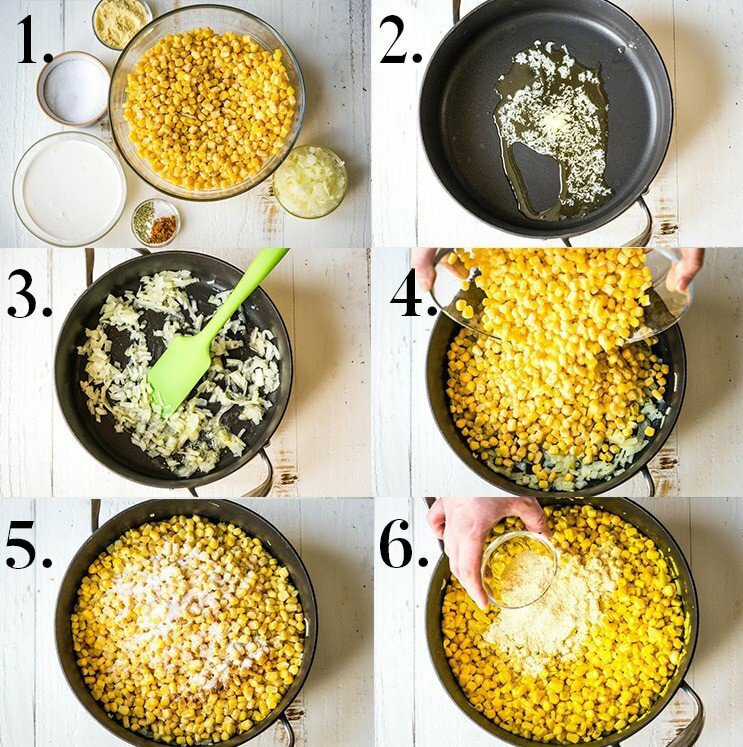 Pin- Make sure to pin this homemade creamed corn recipe to your side dish or vegetable board so you can refer back and find it later! Click here to pin it! Create- When you make this recipe, post it on Instagram! Seeing pictures of your creations makes my day! Be sure to tag me on Instagram and use the hashtag #heatherlikesfood. Every week I pick a few of my favorites to share in my weekly newsletter. Rate- If you make this recipe and love it, make sure to come back to this post, comment and give it a star rating! Those ratings help me get in front of more eyes and show the Google gods that my recipes are worth sharing. Thanks so much for your help! 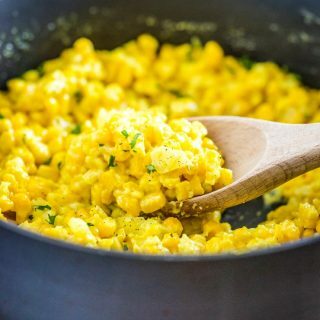 Creamy, sweet and savory, this creamed corn recipe is the perfect side dish to just about anything! Melt butter in a 3 quart pan over medium heat. Add the onion, salt and rosemary to the pan and saute onion until very soft- about 5-6 minutes. Add the corn, turmeric, sugar to the pan and continue cooking over medium-high heat until the corn is heated through and is starting to release some liquid-- about 2 minutes. Sprinkle the cornmeal over the corn mixture and stir to combine. Add the cream to the pan, stirring constantly until thickened. Reduce heat to low and simmer until corn is very soft, about 2-3 minutes. Choose fresh or frozen corn kernels. Fresh will make a softer recipe as the kernels will likely be smaller. Really scrape the cob with the back of the knife to release all the bits of corn pulp and add them to the pan. Frozen corn works just as well though. (That's what I used in these pictures). Let the onions cook until very soft or you'll have crispy pieces of onion in your creamy corn. When adding the cream, stir continuously until the mixture thickens or you'll be left with lumpy creamed corn.